By having commuters document where they see wildlife, planners are better able to understand the animals as they design 24 wildlife crossings. 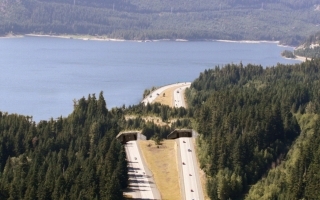 This wildlife overpass near Keechelus Lake would be built in the second phase of ongoing improvements to a 15-mile corridor of I-90 at Snoqualmie Pass. Construction would begin in spring 2014, at the earliest. WSDOT is looking at wildlife crossings in Banff, Canada, for design ideas. YAKIMA — There was no way the agencies monitoring wildlife along the Interstate 90 corridor could supply the manpower needed for a yearlong survey of animals along the highway, so they turned to you.